First Daughter is an underrated classic. If you don't remember the plot of Katie Holmes' second best movie (behind Batman Begins), it's about the daughter of the president of the United States going off to college and struggling to live and date like a regular person. She ends up falling in love with an undercover secret service agent played by Riley from Buffy the Vampire Slayer. First Daughter always comes to mind when I think of either of the Obama daughters dating, which I do often. Malia Obama has not fallen in love with an undercover secret service agent. She is reportedly dating a fellow Harvard student named Rory Farquharson. Rory plays rugby. Rory’s family has ties to the royal family. Rory went to a super prestigious high school in the UK. Rory sounds like the WORST. The Daily Mail has pictures of Malia and Rory making out at a Harvard-Yale football game. I want to be on Team Malia here and just yell “yaasss girl” at the fact that she’s getting some at a football game like a regular 19 year old college student but I just can’t get on board. 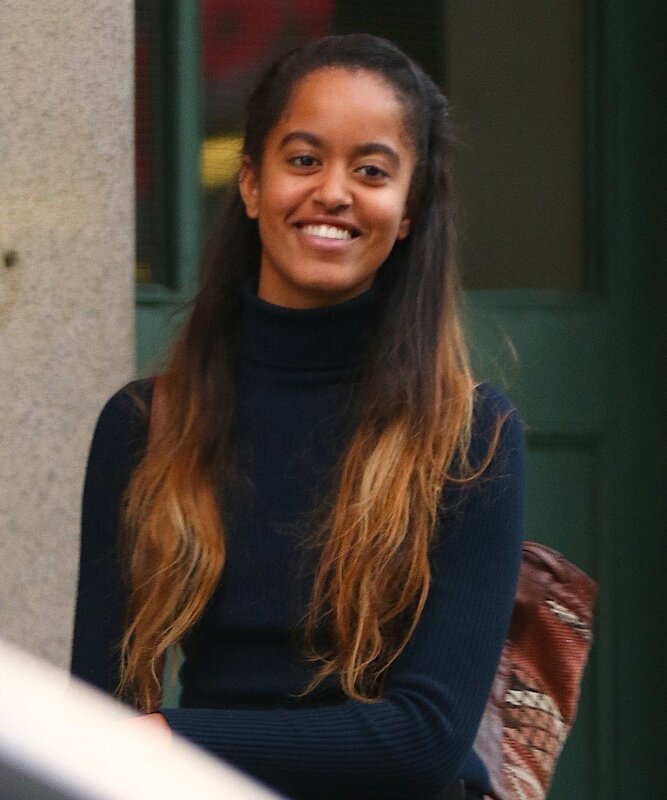 I’ve established that I think about Malia Obama a lot, more than anyone who is not actually related to her should. She is my imaginary niece. She and Sasha are the only First Children I recognize. When Malia was doing her internship during her gap year, I wrote that while I was irrationally obsessed with her every move, I hoped that she could go to college and live a normal life (the post linked here was written before we knew what we now know about Harvey Weinstein) full of keg parties and makeouts at Harvard-Yale football games. This is what I wanted for her but these photos of Malia and her college crush make me worry. It's not because she's dating. It's because she's dating a kid who seems like he's a Grade A douchebag. Not only does he have a severe case of douche face, he's also a rich white guy who is the son of an investment banker and second cousins with one of the Queen’s most trusted aides. This kid is a walking embodiment of white privilege. Sure, Malia's parents are also a bit successful or whatever but we know their values. We know Barack and Michelle are exceptional human beings who have passed on their work ethic and moral standards onto their daughters. This guy once described himself as “an overconfident public school boy” and his cousin says he'd be all about the fame that will inevitably come with dating an Obama. I don’t f-cking trust him. When Lainey and I were emailing about this, she made it clear she also doesn't approve of Rory Farquharson and hopes this is just a college hookup for Malia, not the man she plans to marry. Listen, they are both 19. Malia just started at Harvard in September. We know she cares about her career. I doubt she’s thinking about settling down with “a total Steff” (that Pretty in Pink reference was brought to you by Elaine Lui). I'm sure Harvard is full of Steffs. This guy is probably just the first of a long line of douches Malia will be kissing during her college years. He probably won't be her James Lansome but he still makes me worry. Heartbreak at that age is no joke. My first kiss in first year university was a guy named Geoff who also played rugby and broke up with me when he found out I was still a virgin. Maybe I’m a little biased against guys who play rugby but homeboy was the WORST. I was pretty broken up about it until I moved on to the next douchebag of my college years. Rory the Rugby Player will hopefully be a footnote in Malia’s dating history that she’ll laugh about with her girlfriends but as her Auntie, I don’t want Malia to experience anything other than happiness and joy. If anyone gets hurt in this equation, I really hope it’s Rory Farquharson. I also worry about how mortified Malia will be when she's my age and every guy she's ever dated has been dissected by strangers on the Internet. The only solace I take in this situation is that this guy wouldn’t make it through one dinner with Barack and Michelle. If this makes it past the hookup phase to the dinner-with-the-parents stage, I trust that America's Mom and Dad have it handled.